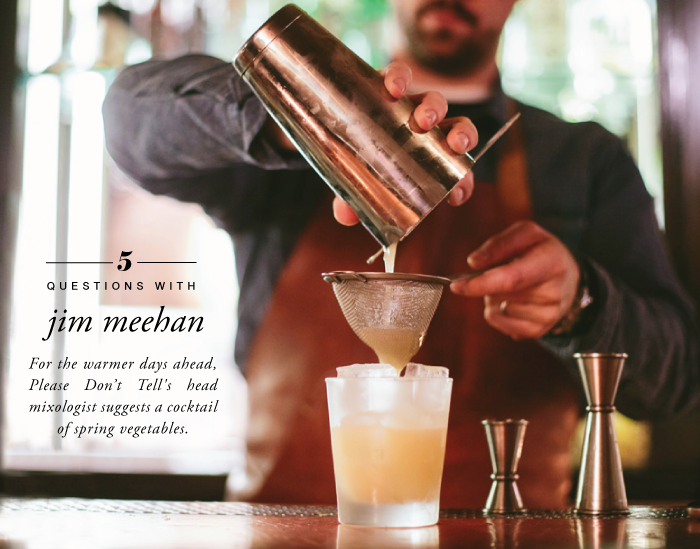 Jim Meehan is the owner and head mixologist of Please Don’t Tell, New York’s favorite speakeasy-inside-a-telephone-booth-inside-a-hot-dog-shop. Once it gets warm enough (fingers crossed), we’re looking forward to sitting out on the roof with Jim’s spring cocktail of asparagus tips and other harbingers of spring. What’s your dream location for a spring cocktail party? Every year in Tokyo, there’s a day set aside to celebrate the blossoming of the cherry trees called hanami. Thousands of people gather in public parks to picnic and celebrate the season. I can’t think of a better way to toast the spring. Who would make the perfect +1? For me personally: my wife. For everyone else, Winston Churchill: the man loved to drink and enjoyed the finer things. What’s your favorite cocktail memory? Stephen Remsberg is an acquaintance of mine who happens to have one of the most amazing collection of old rums in the world. I’ve been fortunate enough to be his guest at his home in New Orleans where he’s shared with me some of the rarest drams I’ve ever tasted. My visits with Stephen are priceless and a truly special experience. What’s your ideal springtime drink? Muddle the Cointreau and vegetables. Shake, then fine-strain into a St. George Absinthe-rinsed coupe. Garnish with an orange twist. Before the flowers blossom and the berries ripen, root vegetables such as fennel and celery overflow from the chef’s table until flowering shoots such as asparagus become available. Aquavit, which is traditionally distilled from caraway, citrus peel, anise and fennel, work well within this Scandinavian sour. What’s your early exit strategy? I have a one-year-old and a bar that’s open 7 days a week, so it isn’t tough to find an excuse to leave a party. Design a cocktail party invitation on paperlesspost.com.